A 30th birthday is one milestone that can be met with excitement or dread and often a mixture of both. While it’s not quite the time for an Over the Hill party, the third decade definitely symbolizes that someone is getting older. That’s why these 30th birthday messages are a perfect fit no matter what your birthday boy or girl may be feeling. With a little wit mixed with humor, you can send a happy birthday message that will make sure the 30-year-old in your life smiles on their special day. From inspirational well wishes to those that give a little dig at getting older, you can pick and choose the message that you know will set the right mood. 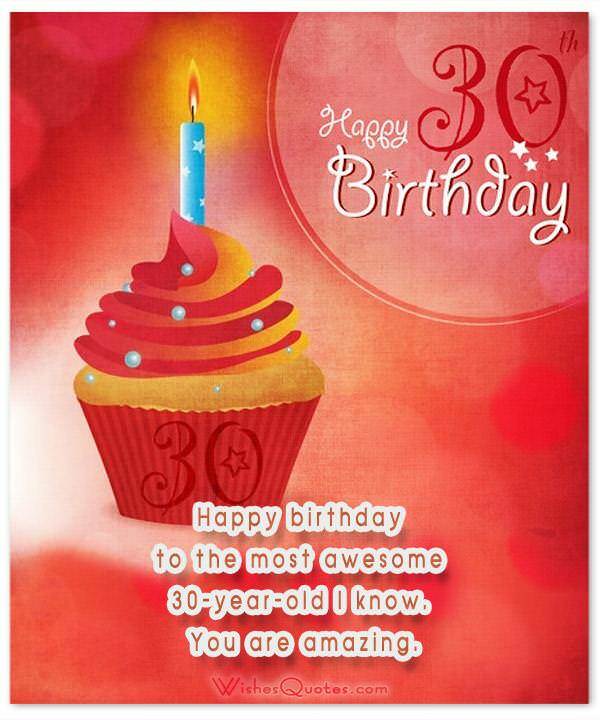 So go ahead, and get ready to send a text, Facebook message or add a line to the perfect card to get your special someone’s 30th year off to the right start. By 30, if you don’t know what you are doing in life yet, then you are just like the rest of us. Welcome to the “over 30” club! Wishing you happy birthday on this beautiful morning. Here’s a tip-don’t look in the mirror. You are only as old as you feel. Kiss your 20s goodbye, and embrace your 30s. Happy birthday. They say never trust anyone over 30, but I say never trust anyone under. Glad to say you’ve finally earned by trust. Happy birthday! With old age comes great responsibility. You must now live it up like you’re still 20. See you at your party tonight! Everything I know, I discovered after 30. This decade is full of excitement. Welcome to 30. It’s all downhill from here. Just coast and enjoy the ride! Thirty is the perfect balance between young and old. Enjoy being both youthful and full of maturity. It’s awesome. Hey! Did you hear that 30 is the new 20? No? Well, neither did I! You’re still awesome anyway! Happy Birthday!!! Happy birthday, sweetheart. I’m looking forward to the next decade with you. On your 30th, you can eat the whole cake if you want to. Take that kiddoes! Happy 30th. Remember they say that wrinkles are a sign of wisdom, and gray hair is a sign of….oh, never mind. You should probably just get some hair dye. I was going to tell you something, but I forgot what it was now. Oh well, it happens a lot after 30. You’ll get used to it. Just kidding. Happy birthday! At 20, you were young and strong and beautiful. At 30, you are only getting better. Embrace your day! I heard someone was turning 30. When I heard it was you, I couldn’t believe it. You don’t look a day over 29. Happy birthday, if it is indeed true. Thirty is the best time to take a good look at how far you have come and plan where you are going. Make the next ten years better than the last. Age is just a number. You are the same person today that you were yesterday. Except you are looking more beautiful than ever. Happy birthday! I won’t make a big deal about 30. But wow…it is pretty old. Try to enjoy your day, birthday boy! By 30, you have learned who your real friends are, and who you should let go. I’m happy to say that I am still by your side, and plan to be well beyond our 60s. Happy birthday, friend. Just wanted to say happy birthday to the sexiest 30-year-old I’ve ever seen. You only get more amazing every year. Let’s do something special tonight! At 30, any weight gain can only be attributed to the wisdom of old age. So go ahead and dig into that cake. Your birthday only comes once a year. Enjoy it! Congratulations on officially becoming old. Seriously, 30 isn’t that bad. Or at least I’ve heard. Glad it’s you doing it first, and not me. Ready, set, go! The final countdown to 40 has started! Here’s to ten more years of fun and crazy antics. Now that you’re thirty, it’s about time to start acting your age. You’ve got such a youthful personality, no one will ever believe you’re in your third decade. You are now one-third of the way to 90. Keep it up! Don’t worry. You are not really 30. You are 21 with 9 years of experience. Let’s celebrate!